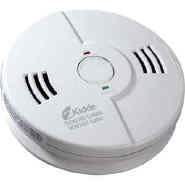 Carbon Monoxide/Smoke Combo Alarms provide two important safety devices in a single unit. These alarms include a voice warning system that announces "Fire, Carbon Monoxide, Low Battery or Smart Hush™ activation." These technically advanced combination alarms use ionization sensors to detect fire. They are easy to install, suitable for all living areas and have a five-year limited warranty.